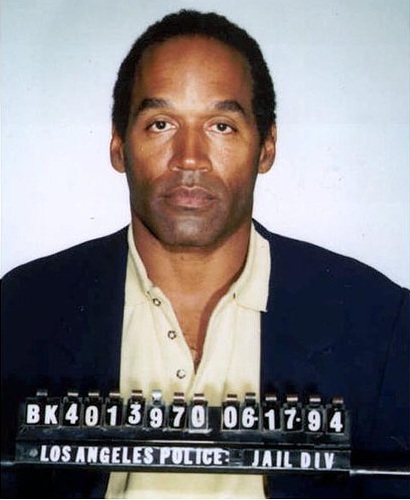 Twenty years after O.J. Simpson’s acquittal in an extraordinary murder trial that stretched for months across the watershed year 1995, the legacies of the case are still contested. The vivid clash of reactions to the verdicts read in Superior Court in Los Angeles on October 3, 1995, were widely interpreted as signaling a yawning racial divide in the United States. Many African Americans reacted jubilantly to Simpson’s acquittal; many white Americans were left despairing. Simpson, who is serving an extended prison sentence in Nevada on criminal convictions unrelated to the 1995 trial, is a black former football star and onetime pitchman. He was accused of fatally stabbing his former wife, Nicole Brown Simpson, and her friend, Ronald L. Goldman, both of whom were white. Questions of race percolated throughout Simpson’s long and exhausting trial, much of which was televised and routinely attracted sizable audiences. That trajectory, as delineated by national polling data, is an uneven one. But trends, overall, point to greater tolerance in matters of race in America (see chart). 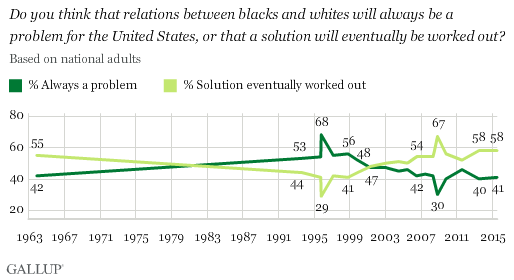 Moreover, in the mid-1990s slightly less than half of American adults approved of interracial marriage, according to polling by the Gallup organization. These days, nearly 90 percent of Americans support interracial marriage. A more nuanced and more revealing explanation for the sharply clashing reactions to the verdicts 20 years ago was that they reflected deep — and persistent — differences in views of the fairness of the American criminal justice system. Polling data have long detected greater suspicions among blacks than whites about the even-handedness of law enforcement — and during the trial in 1995, Simpson’s lawyers went to lengths to characterize their client as the victim of a police conspiracy. The theory, at best, was only faintly plausible. But the verdicts of October 3, 1995, were certainly a rebuke to the Los Angeles police and, as I note in 1995, some of the cheering that day surely was for the reprimand the Simpson jury so sharply delivered to local law enforcement authorities. I argue in 1995 that the most significant and lasting effect of the Simpson trial was in the popular introduction of DNA and the recognition of the decisive character of forensic evidence. “Through the Simpson case,” I write, “the American public gained a measure of familiarity with forensic DNA testing,” a familiarity that has deepened in the years since 1995. The Simpson case was hardly the first in which complex genetic evidence figured prominently. Given the disputes in the late 1980s and early 1990s about the validity of DNA as evidence in criminal cases, it was very significant that Simpson’s lawyers during the trial neither challenged nor attacked the science of forensic DNA analysis. They accepted it. “Instead,” I note, “they went after the sloppy and imprecise ways in which the Los Angeles police had gathered, stored, and processed the DNA evidence in the Simpson case,” blood evidence found at the crime scene — the tiny courtyard outside Nicole Brown Simpson’s townhouse in west Los Angeles where she and Goldman was slashed to death in June 1994. At trial, Scheck extracted acknowledgement from police criminalists that they had mishandled or overlooked DNA evidence in the Simpson investigation. DNA evidence was the centerpiece of the prosecution’s case and Simpson’s lawyers effectively challenged the reliability of that evidence, demonstrating that it was too suspect and unreliable to support a conviction. As such, Simpson’s acquittal became inevitable. The trial’s focus on DNA anticipated — and perhaps stimulated — broad popular interest in DNA and its seemingly wondrous capabilities, I write in 1995. Just five years after the trial, the popular prime-time television series CSI: Crime Scene Investigation went on the air. CSI had a run of fifteen years and many of its episodes drew on the techniques of DNA collection and testing, and elevated that work to a dramatic level. In other ways, too, DNA evidence has reverberated in American life since the Simpson trial. DNA probably has contributed to the declining support for the death penalty in the United States. Popular recognition of the power of DNA evidence may have enabled a new consensus to take hold, a consensus quite opposite to sentiment that prevailed in 1995 when New York State restored the death penalty. Such a move would be unthinkable in 2015. At his trial in 1995, DNA evidence implicated Simpson — and was enough to persuade millions of Americans that he had to be guilty. But DNA failed to convict him. Acquittal, though, brought no exoneration. The broad popular verdict — unshakable over the years — is that Simpson killed his former wife and killed Goldman. No plausible suspect other than O.J. Simpson has emerged: He became a pariah, despite his acquittal. And he never recovered the popular esteem he basked in before he went on trial. 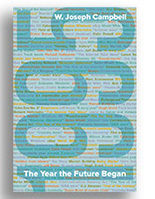 This entry was posted on October 3, 2015 by W. Joseph Campbell in Anniversaries, DNA, Popular culture, Scandal, Simpson trial, Technology, Watershed year and tagged 1995, CSI: Crime Scene Investigation, DNA, Forensic DNA, Hinge moment, O.J. Simpson, Recent past, scandal, Watershed year.